Lyssa Adkins shares her pain as a plan-driven project manager for 15 years. The drive and internal pressure she felt to meet a major deadline overrode her ability to see and treat staff as human beings. Putting her stress onto team members is one regret that she still wishes she could apologize for. Lyssa’s shift into honouring people first began as different mentors helped her gain awareness. In time she discovered that by letting go of ... See More what she wanted, she was able to receive and achieve something even better. 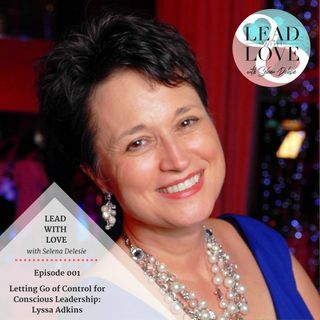 Our conversation on Lead With Love explores letting go of control, navigating difficult conversations, and the power of serendipity. You’ll also hear what her heart pulls her to help with next… climate change. Lyssa's journey from controlling project manager to conscious leadership will inspire and invite you to walk your own path of transformation. Connect with Lyssa at www.AgileCoachingInstitute.com. Lyssa Adkins is President Emerita of the Agile Coaching Institute. She is a passionate player in the Agile Coaching profession. She develops Agile Coaches to be the skilled and visionary change leaders that their organizations need, and that Agile calls for. In 2010, she co-founded the Agile Coaching Institute to answer that call. Since then, ACI has up-leveled the skills of close to 6,000 Agile Coaches and strategized with their organizations to develop Agile Coaching as a core capability for Agile transformation. She is the author of Coaching Agile Teams, which is still a top-10 Agile book many years after publication. When you meet, she is likely to truly listen to you.